Where we are located - note we are moving! Do bed bugs cause harm or spread pathogens? Where do bed bugs occur? How do bed bugs invade a premises? How can you tell if a residence or building is infested? What can I do to manage a bed bug problem? What are my rights and obligations? How can you have suspected bed bug specimens examined? What might you do when returning from a visit to a bed bug infested residence? What should be done in schools about bed bugs? 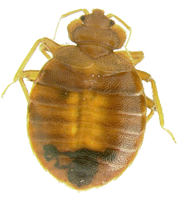 The Brown Peril - How contagious are bedbugs, really? A well balanced article in Slate magazine focusing on the real and perceived perils of bedbugs now and looking back over time.